As part of our Alumni Authors Book fair, we are pleased to welcome Darren Ridgley and Adam Petrash, co-editors of Parallel Prairies: Stories of Manitoba Speculative Fiction. Adam will be providing introductory remarks and Darren will be joined by author and alumnus Patrick Johanneson and local author Craig Russell. 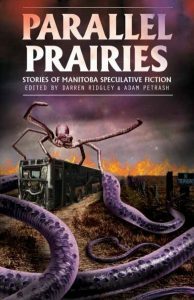 All will be reading excerpts from their stories in Parallel Prairies.